Marcel Redureau, via Pays de la Loire. The final line–“he was apparently not normal”–must have seemed ironic the day the item was published. 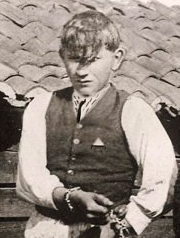 Hearst’s International, in an article about “Terrible Children,” wrote that the Redureau case led French papers to actively discuss what it termed with characteristic Hearstian reserve as a “red wave of child criminality.” Reasons for this horrific juvenile zombie horde apparently laying waste to European principalities before the Great War were thought to include “alcohol, inherited tendencies, non-moral education, the absence of religion and the anarchy of the times.” So killer emo/goth kids are nothing new, I guess. Marcel Redureau’s crime was the subject of a book by author André Gide, The Ridereau Case (L’Affaire Redureau). Gide analyzed the course of justice in this case, and you can read some of his writing on it in English here. 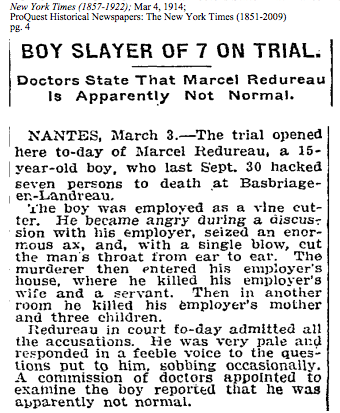 It appears that Redureau, who reportedly had a normal childhood, was probably clinically and quite possibly legally insane. As noted here, the boy was sentenced to 20 years in prison, only to die after 4 months from tuberculosis.